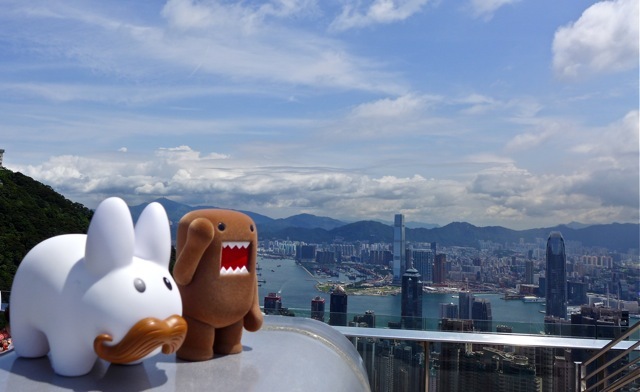 Pipkin and Domo walked through Kowloon to the Star Ferry Terminal, took the ferry across Victoria Harbour, and then took the Peak Tram up to Victoria Peak. 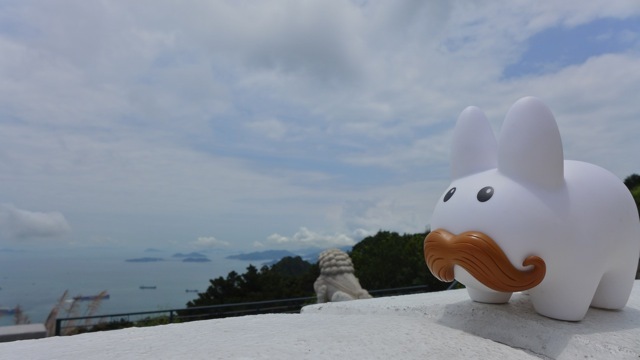 It's rather dark waiting for the tram, but labbits feel cozy in dark, underground places. Here comes the tram! 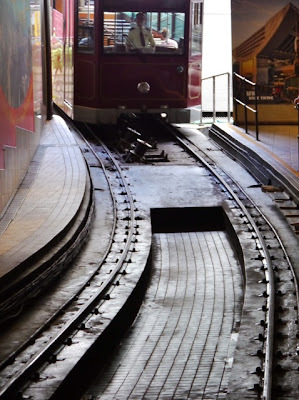 The Peak tram is an electric funicular railway. It travels 1364 m (4475 ft) and gains 368 m (1207 ft) with varying grades of steepness. At its most steep, it travels at 48% grade! 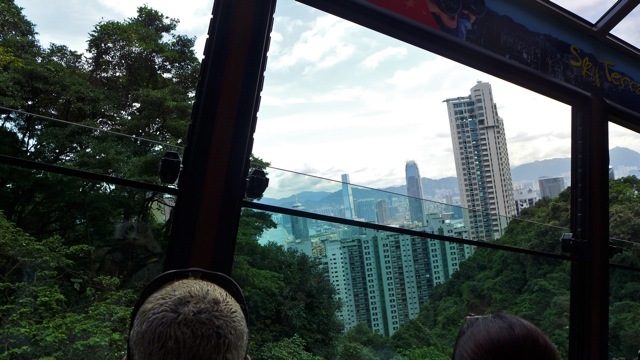 The Peak Tram provides beautiful views of Hong Kong and Kowloon. 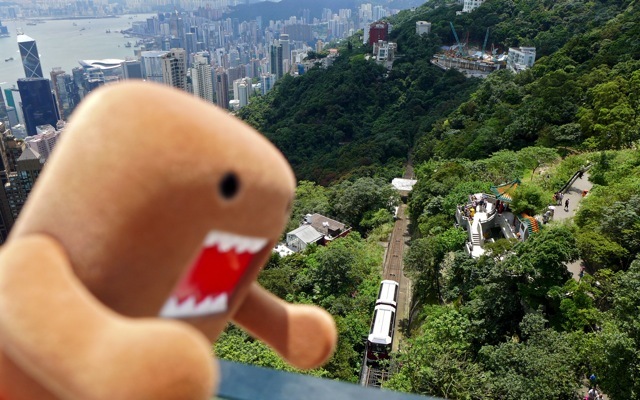 There are only a few stops midlevel, and the trip takes under 5 minutes to reach the peak terminus. 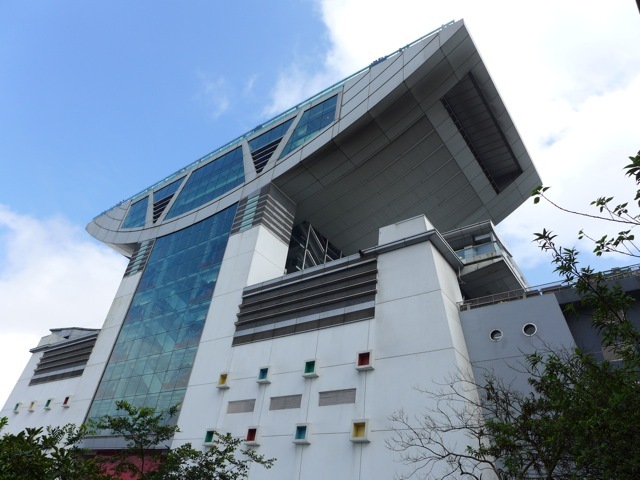 Off the tram, you arrive at the Peak Tower, a shopping, entertainment and food complex with a 360° view at its observation deck. Through the windows you can just make out all the escalators that take you up to the top. 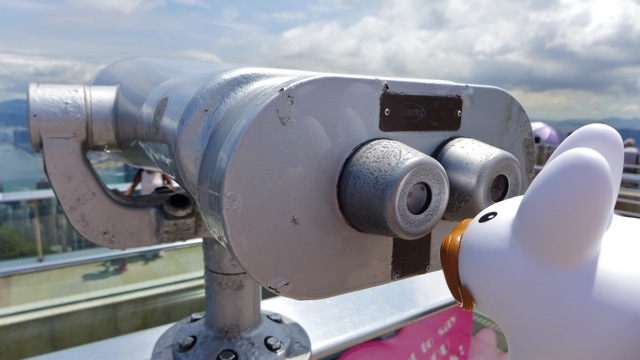 Pipkin tries to find his giant ducky friend across the harbour. 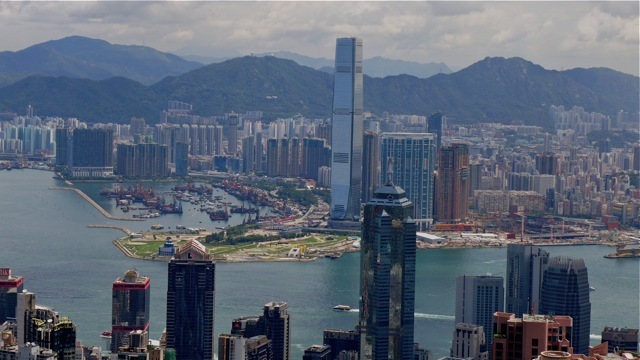 The view from the peak: Central, Victoria Harbour, Kowloon, and the New Territories beyond. 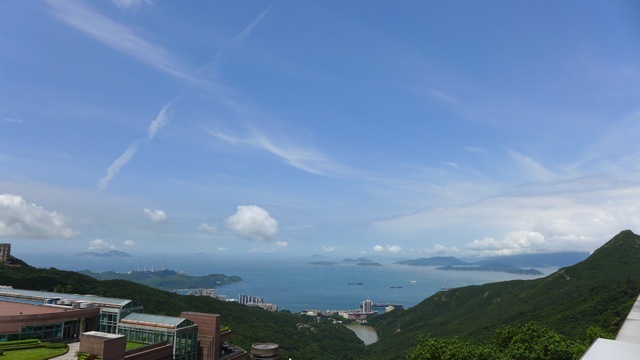 The viewing deck at the Peak Tower is heavily advertised because the Peak Tower obviously wants you to spend your money inside the complex, but if you're willing to sweat in Hong Kong's humid, subtropical climate, you can walk up Mount Austin Road, where you will find residences, Victoria Peak Garden, Mount Austin Road playground, and more views from the top. 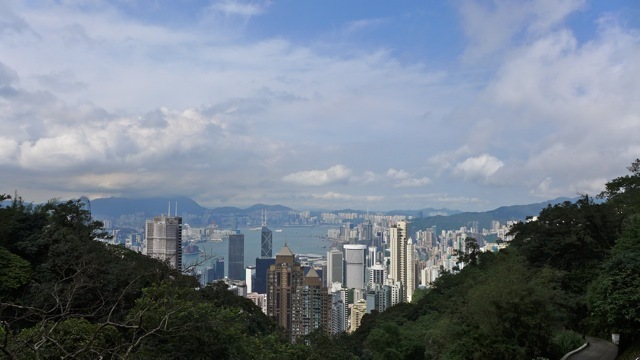 The sweat equity is worth it, if you want to get away from all the tourists at The Peak Tower. 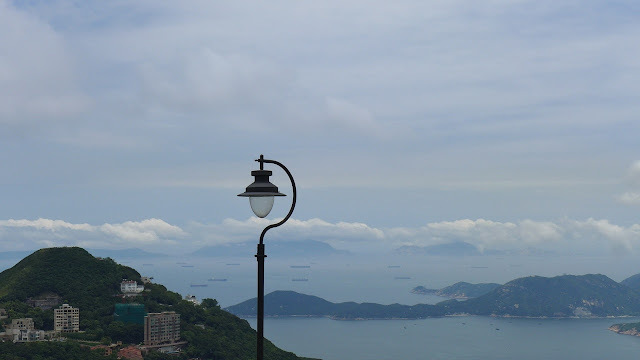 Here at the top, it is quiet and you can get lost in the views of ships in the ocean. 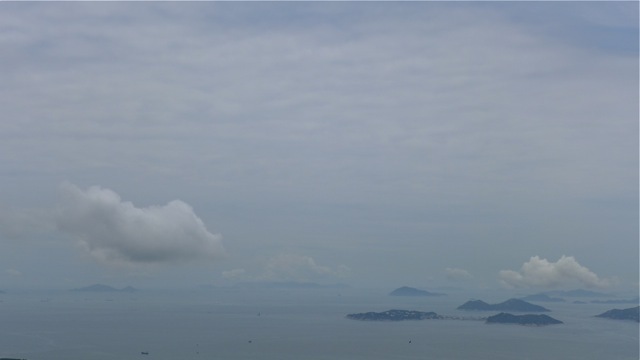 In the distance, it's difficult to tell where sea ends and sky begins. The islands look like mountain peaks in the clouds, and Pipkin imagines those giant ships sailing dream like through the sky. It's hard to go up any further. 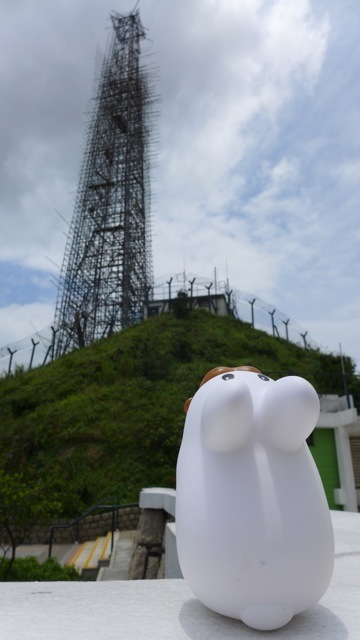 There's nothing but communications towers, and although Pipkin and Domo tried to hike higher, a construction crew turned the two back, since the area is fenced off. Since they took the tram up, they decided to walk down Old Peak Road. 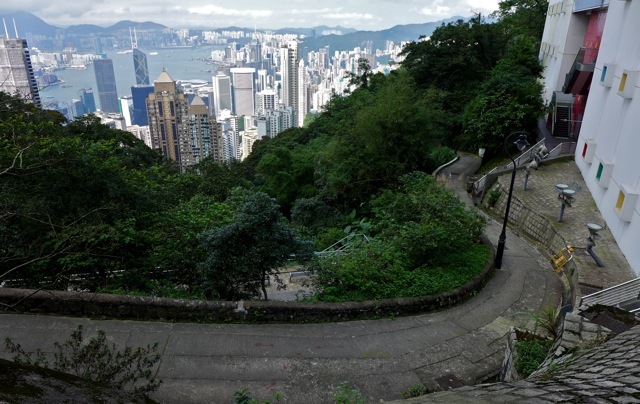 It is a steep, winding, pedestrian road that will take you right down to the Zoological and Botanical Gardens. 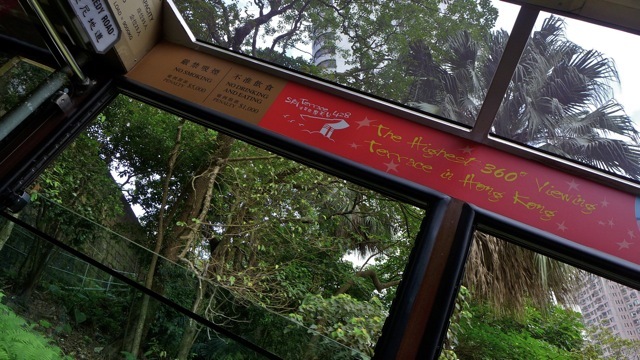 Just a few steps to the east on Kennedy Road is Hong Kong Park. Zig zaggy Old Peak Rd.